There’s rich, there’s really rich, and then there’s Carlos Slim. The Mexican businessman, generally acknowledged as the richest man in his home country, has also managed to crawl his way to the top of the Forbes 20 richest people in the world list. This marks only the second time since 1995 that someone has managed to top Bill Gates as the richest person in the world list. 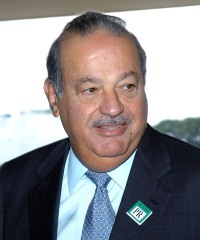 Carlos Slim Helu has managed to turn the struggling Mexican phone industry into America Movil, the fourth-largest cell phone company in the world. He’s then used that money to buy department store chain Saks, the New York Times Company, and pretty much everything else he could possibly want, showing an amazing ability to buy struggling properties and turn them into money machines. Balance that with a frugal personal life (he drives an older Mercedez and has lived in the same house for 40 years, with no $87,000 rugs in sight) and you can see why he’s become so wealthy. Whatever the guy does usually ends up being the right thing. Even when he’s wrong, somehow he doesn’t lose his shirt. It’s amazing. I wish I had half his business sense, or even a tenth of his money.